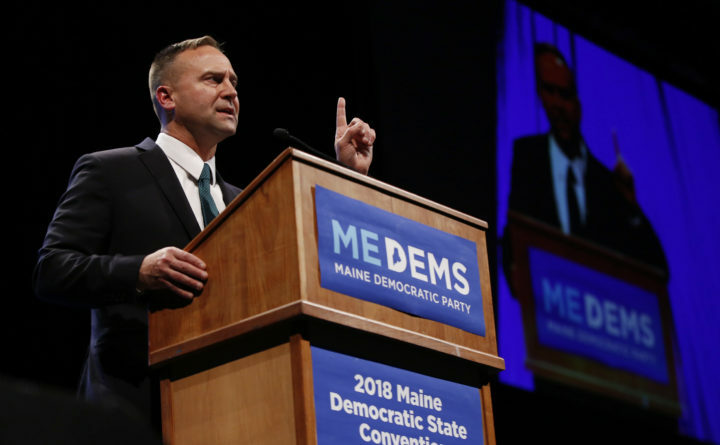 Gubernatorial candidate Adam Cote speaks at the Democratic convention, Saturday, May 19, 2018, in Lewiston, Maine. The time for Democratic gubernatorial candidate Adam Cote’s energy business never really arrived. But it could, if he’s elected governor. For that reason, Cote said he’d give up his 20 percent stake in the company he leads, Renewable Energy Storage of Maine, if he wins the Blaine House. But that company, he said, has been “dormant” since 2014. One major policy he’s proposed could create new opportunity for energy storage technologies in the same way that a lack of such support during the eight years of Republican Paul LePage’s governorship contributed to the company suspending operations. Fortunat Mueller, head of the solar installer ReVision Energy and a supporter of Cote’s energy policies, said clean energy companies have “been playing defense” during the LePage years. Cote and his co-founders saw the business as paving the way for integrating new renewable power sources with the regional grid, making it more flexible. “The fundamental idea for bringing the storage technology to Maine residents and businesses was that — as Maine moves forward bringing more clean energy sources online — we would have the storage capacity in place to store and use that energy and replace the ‘as needed’ burning of fossil fuels to meet demand,” Cote said. They avoided electric battery technology, he said, seeing others already doing that work. About 75 percent of homes used oil heat when the company was founded. About 62 percent of Maine homes still used oil heat in 2016, according to census estimates. Renewable installations and changes in energy billing didn’t play out as the company founders had hoped. By 2014, unfavorable power rates, plummeting oil costs and Gov. Paul LePage’s promotion of heat pumps as a preferred electric heating option added headwinds. The trials of Cote’s company shed light on how his business career has shaped his approach to achieving his goal of powering Maine by 100 percent clean energy within 10 years and how it ties into a broader economic plan for the state. Cote has built his campaign on his military service and an energy-related business career spanning back to his start as an energy attorney at the Portland firm Pierce Atwood in 2001. There, Cote said, he worked on licensing and permitting for a tidal energy project, and power purchasing contracts for hydroelectric and biomass facilities. Cote worked in that job until running for Congress and launching RESM, in 2008. The company resold what are essentially heating or cooling “batteries” powered by electricity. The North Dakota-based Steffes Corp. made its main product, a unit that uses electricity to heat a ceramic block, which stores thermal energy to use later. Such storage technologies, including large-scale batteries, are widely viewed as a precursor to adding more renewable power generation to the grid. That’s because renewable sources have a reliability problem: A passing cloud or lull in the wind could cut the juice. But storage could enable using solar-powered heat even when the sun is hiding, or when the wind has died down. With the idea that a crush of renewables would require that kind of flexibility, Cote and his co-founders — including developer and businessman Samuel Zaitlin, and energy attorneys Kimball Kenway and Arthur Adelberg — started Renewable Energy Storage of Maine LLC. “We knew and saw in other countries and parts of the United States, that energy storage was a critical part of the solution to shifting from fossil fuels to clean energy,” Cote said. While their business wasn’t directly in the generation of clean energy or manufacturing clean energy technologies, its success relied on demand for storing cheap renewable power or cheaper off-peak electricity from traditional sources. And they had reason to think renewables were about to take off. Maine had set a goal of putting 8,000 megawatts of new wind generation online by 2030. Fossil fuels were also more expensive, meaning prices looked more favorable for renewables such as wind and solar, whose fuel costs are fixed at zero. “We also anticipated the emergence of numerous solar projects in Maine, given the suitability of our climate, the need for clean power in New England, and the significant reductions in costs comparative to fossil fuels,” Cote said. The company sought partnerships with wind developers, including now-Sen. Angus King’s Independence Wind, which would offer the company’s heating units at a discount. Those units could use the electricity wind farms generate at night, when demand is lowest. In exchange, customers could get a discount on that power. Access to discounts for off-peak power was critical to the plan, but that kind of dynamic pricing did not come to be in any big way. And, up until 2014, Cote’s co-founder Kimball Kenway grappled with regulators to make more aggressive moves to change power prices based on real-time demand. Cote’s plan to boost clean energy jobs leans on that core policy proposal, which his company long advocated: making power cheaper at times of lower demand, modeling examples in other parts of the country, such as Austin, Texas. In 2014, his co-founder Kenway took that battle on, in Central Maine Power Co.’s rate case. Kenway chided regulators for not designing Central Maine Power Co. rates to change based on demand, and for incentivizing homeowners to install electric heat pumps for air-conditioning, which on the hottest days use electricity at the same time as other cooling units. The situation, Kenway said, stands to place strain on the lines that carry electricity and force upgrades that ultimately fall on the backs of power customers. Those “price and policy signals have created a transmission cost time bomb,” he wrote. He argued that “a profound change is in order,” one that would have benefitted technologies such as the heating units RESM once sold, since they shifted power use away from times when people use the most electricity. Cote said those real price signals, called “time-of-use” pricing, could open up short-term and long-term savings, giving customers access to cheaper power at periods of low demand and, in shifting that usage, lowering demand for expensive power line upgrades. Cote, who in late 2016 resumed work as an energy attorney at the Portland firm Drummond Woodsum, said new policy could drive energy business in Maine. Cote is still CEO of the company, and it remains registered to do business in Maine, but it has no current contracts with energy equipment makers or power suppliers. It remained involved with a pilot project in Boothbay through 2016. “The LLC is still registered with the secretary of state, but the partners, myself included, have all moved on to other things – which includes running for governor in my case,” Cote said. Cote attributes his company’s slip into a dormant phase to three major factors: falling heating oil prices, fewer renewables coming online than expected and personal matters. A life-threatening illness took one partner out of the business, and Cote’s third deployment to Afghanistan with the U.S. Army National Guard came at “a critical time for the business,” when it was hoping to prove the case for its devices through two pilot projects. There was a fourth factor: power rates for the electricity supply and delivery rates, or the cost of having a home or business connected to the grid. While homeowners currently can’t pay for electricity supply based on the time they use that electricity, Central Maine Power offers discounts in their rates based on the time of use. But, by 2014, Kenway told regulators that discounted rate became less favorable, increasing 65 percent since they started the business in 2008. “This is seriously undermining the economics of [electric thermal storage] as an alternative to oil,” Kenway said. At those costs, he said, it would take roughly 18 years of operation for customers to recoup their initial investment. Mueller, with ReVision Energy, said such policy and rate design can have a big impact on energy technology businesses. “You’re kind of at the mercy of the utilities or the utility regulators to make it fair,” Mueller said. The price of electricity itself was posing headwinds for RESM, too. Outside of pilot projects, the company had inked a deal with Dead River Co., which would supply off-peak power at a discount to customers with those units. That included a larger share of hydropower than the typical regional mix, but Dead River shut down its power supply business at the end of 2014, in the face of rising wholesale costs. The experience informs Cote’s support of time-of-use pricing, a change that would create a foundation for the broader aims of the energy platform that’s a key plank of his campaign. Cote has touted his long experience in the industry as a unique characteristic in the Democratic primary, to which Mueller, with ReVision Energy, attested.